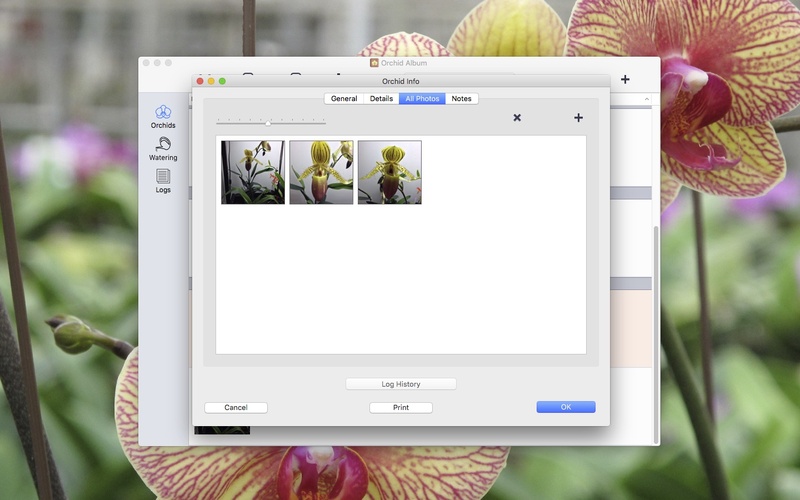 Track your orchid collection on your Mac! 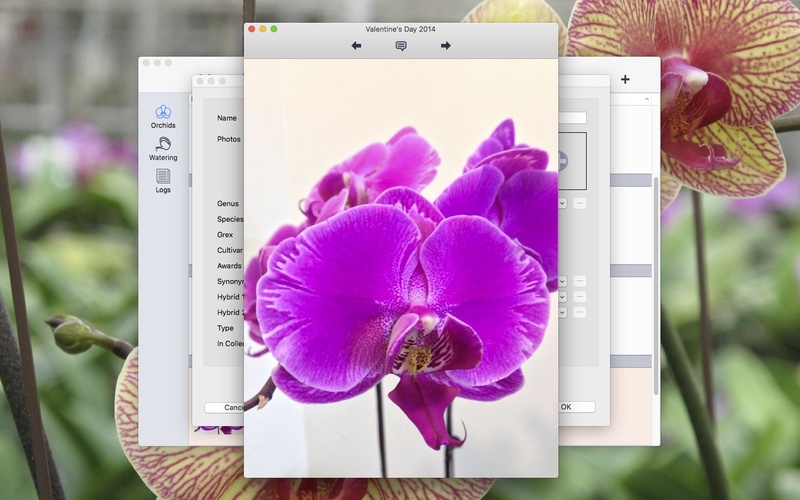 Orchid Album makes keeping track of your orchids easy. Track development of your plants throughout their lives, on your Mac! Whether you’re new to orchids, or an experienced collector, Orchid Album is the ideal tool for organizing your plants, watering schedules, and notes. Want to track your collection on the go? Transfer your database to and from Orchid Album on your iPhone, iPad, or iPod touch (available on the iOS App Store). Looking for the Windows PC version? Orchid Album for PC is now available. The download version initially runs in an unregistered trial mode, limited to 3 orchids, 3 watering schedules, and 3 logs, with 3 photos each. It will also only allow a single database to be open at a time, and database import is disabled. Purchasing a license either within the app or via the Web Store unlocks full functionality. Record details about your plants, including botanical name, hybrid names, flowering details, fragrance, dimensions, and watering needs. Select from over 500 botanical names (with over 100 genera), or add new names. Sort orchids by name or genera. Track watering schedules for multiple plants. Track flowering, fertilizing, and other events for every plant in dated log entries. 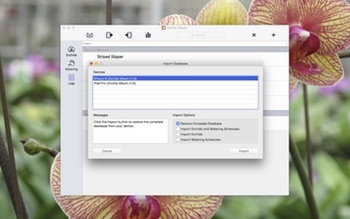 Create and edit log entry reminders linked to your calendar. 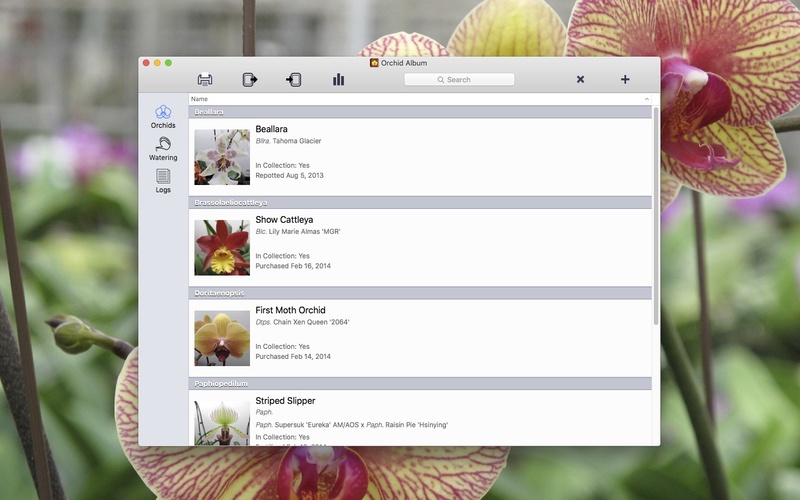 Use the search field to quickly search orchid, watering schedule, and log lists. Add multiple photos per plant and log entry. Add text captions for each photo. 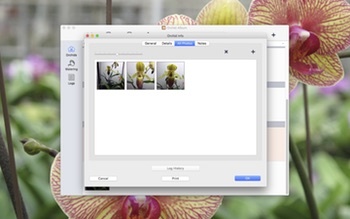 Select photos to appear on the main thumbnail display for each orchid or log. View photos in a full-size gallery view, or in thumbnail form. Rearrange photos with multiple selection and drag-and-drop support. View the log history for each plant, sorted by date. Review statistics for your collection. Print orchid, watering schedule, or log lists, or information for a particular orchid, watering schedule, or log. Database import and export over WiFi to Orchid Album on your iPhone, iPad, or iPod touch. 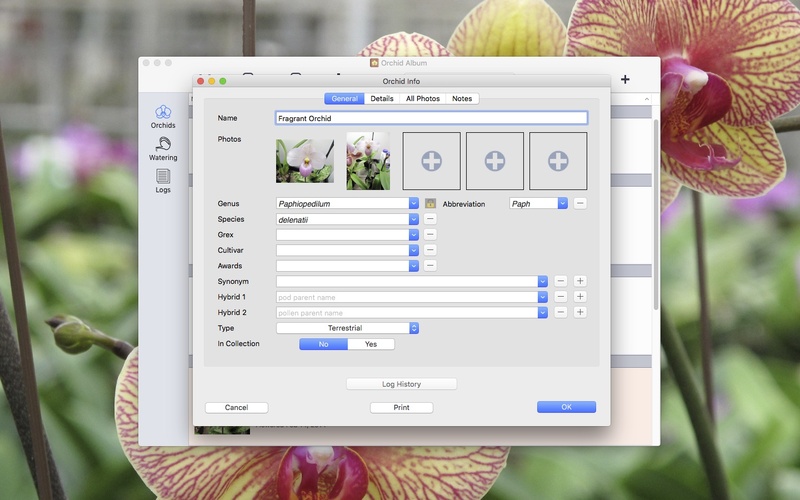 Import / export via CSV format to transfer your Orchid Album database to and from desktop spreadsheet applications. Orchid Report HTML export. View your collection on your computer’s web browser. Great for keeping track of your collection for inventory or insurance purposes. Please note that Orchid Album does not come preloaded with any photos, nor does it include any plant care information and so forth. It only tracks information and displays photos you’ve added yourself. New botanical names can now be added for the Synonym, Hybrid 1 and Hybrid 2 fields. Send me an email at if you have any questions, to request features, or report any issues. You might also want to check out the Orchid Album for Mac Frequently Asked Questions (FAQ) page. Join the Facebook page to discuss Orchid Album with other fans.